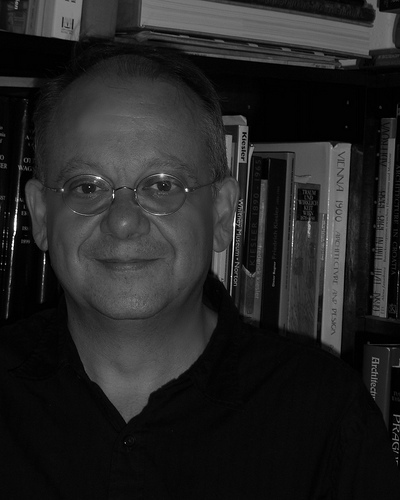 Professor Long studied at the universities of Graz, Munich, and Vienna, and he received his Ph.D. at the University of Texas at Austin in 1993. From 1994 to 1995, he taught at the Central European University in Prague. His interests center on modern architectural history, with a particular emphasis on Central Europe between 1880 and the present. Trained in history rather than in architecture, his approach borrows from cultural and intellectual history, as well as political and economic history. He has studied questions of cultural representation in architecture, the larger ideological context of late nineteenth- and early twentieth-century architectural theory, and the development of architectural education. Professor Long's interests also include modern design in Austria, the Czech lands, and the United States. He has worked on several exhibitions and publishes widely on a diverse range of subjects. Případ Adolf Loos. Brno, Czech Republic: Barrister & Principal, 2017. Adolf Loos on Trial. Prague: Kant, 2017. The New Space: Movement and Experience in Viennese Modern Architecture. New Haven and London: Yale University Press, 2016. Der Fall Loos. Vienna: Amalthea Signum Verlag, 2015. Kem Weber: Designer and Architect. New Haven and London: Yale University Press, 2014. Paul T. Frankl: Autobiography. Los Angeles: DoppelHouse Press, 2013 (edited, with Aurora McClain). Josef Frank: Schriften / Josef Frank: Writings. 2 vols. Vienna: Metro Verlag, 2012 (edited, with Tano Bojankin and Iris Meder). The Looshaus. New Haven and London: Yale University Press, 2011. Paul T. Frankl and Modern American Design. New Haven and London: Yale University Press, 2007. Josef Frank: Life and Work. Chicago and London: University of Chicago Press, 2002. “Subjektive Wahrnehmung und dynamisches Erlebnis: Josef Franks Ideen zur Raumplanung” / “Subjective Perception and Dynamic Experience: Josef Frank’s Spatial Planning Ideas,” in Christoph Thun-Hohenstein, Hermann Czech, and Sebastian Hackenschmidt, eds. Against Design: Josef Frank: Das anti-formalistiche Werk des Architekten / The Architekt’s Anti-Formalist Oeuvre (Basel: Birkhäuser; Vienna: MAK—Österreichisches Museum für angewandte Kunst, 2015): 122-39. “Josef Frank und der American Way of Life” / “Josef Frank and the American Way of Life,” in Christoph Thun-Hohenstein, Hermann Czech, and Sebastian Hackenschmidt, eds. Against Design: Josef Frank: Das anti-formalistiche Werk des Architekten / The Architect’s Anti-Formalist Oeuvre (Basel: Birkhäuser; Vienna: MAK—Österreichisches Museum für angewandte Kunst, 2015): 276-87. “Vermächtnis einer Kampfdekade: Ornament und Verbrechen ab 1909,” in Christian Witt-Dörring and Matthias Boeckl, eds. Wege der Moderne: Josef Hoffmann, Adolf Loos und die Folgen; exh. cat (Basel: Birkhäuser; Vienna: MAK—Österreichisches Museum für angewandte Kunst, 2014): 184-95. “Paul T. Frankl: Ein Wiener Designer in New York und Los Angeles/Paul T. Frankl: A Viennese Designer in New York and Los Angeles,” in Monika Pessler, ed., Paul T. Frankl: Ein Wiener Designer in New York und Los Angeles (Vienna: Österreichische Friedrich und Lillian Kiesler-Privatstiftung, 2013): 4-23. “Ornament is Not Exactly a Crime: On the Long and Curious Afterlife of Adolf Loos’s Famed Essay”; “Ornament ist nicht wirklich ein Verbrechen: Über die lange und kuriose Nachwirkung von Adolf Loos’ legendärem Vortrag”; “Ornamento não exactamente crime: sobre a longa e curiosa vida póstuma do famoso ensaio de Adolf Loos,” in Adolf Loos: Our Contemporary/Unser Zeitgenosse/Nosso Contemporâneo, edited by Yehuda E. Safran, exh. cat., CAAA Centre for Art and Architecture Affairs in Guimarães, Portugal; Museum für angewandte Kunst, Vienna; and GSAPP Gallery, Columbia University (New York: GSAPP, Columbia University, 2012): 31-48; 109-26; 185-201. “Geddes’s Furniture Designs,” in Donald Albrecht, ed., Norman Bel Geddes Designs America; exh. cat., Harry Ransom Humanities Research Center, University of Texas at Austin; New York City Museum/New York: Abrams, 2012): 214-27. “The Rise of California Modern Design, 1930-1941,” in Wendy Kaplan, ed., California Design, 1930-1965: “Living in a Modern Way,” exh. cat., Los Angeles: Los Angeles County Museum of Art/Cambridge, Mass., and London: MIT Press, 2011: 60-89. “Josef Frank in New York,” in Iris Meder, ed., Josef Frank—1885-1967; exh. cat., Vienna: Jüdisches Museum der Stadt Wien/Salzburg and Munich: Verlag Anton Pustet, 2007: 67-74. “Space for Living: Josef Frank's Architecture,” in Nina Stritzler-Levine, ed., Josef Frank, Architect and Designer: An Alternative Vision of the Modern Home, exh. cat. New Haven: Yale University Press, 1996: 78-95. “The Wayward Heir: Josef Frank's Vienna Years, 1885-1933,” in Nina Stritzler-Levine, ed., Josef Frank, Architect and Designer: An Alternative Vision of the Modern Home; exh. cat. New Haven: Yale University Press, 1996: 44-61. “Josef Frank och modernismen,” in Mikael Bergquist and Olof Michélsen, eds., Josef Frank-arkitektur; exh. cat. (Stockholm: Arkitekturmuseet, 1994): 24-31. German edition: “Josef Frank und die Moderne,” in Josef Frank—Architektur; exh. cat. Basel: Birkhäuser Verlag, 1995: 24-31. “Becoming American: Paul T. Frankl’s Passage to a New Design Aesthetic,” in Alison Clarke and Elana Shapira, eds., Émigré Design Culture: Histories of the Social in Design (London: Bloomsbury Press, 2017): 79-90.
Review of John Vassos: Industrial Design for Modern Life, by Danielle Shapiro, in Design and Culture 9, no. 1 (2017): 108-09. “Josef Frank, CIAM, and the Assault on the Unified Ideal / Josef Frank, CIAM, en de aanval op het eenheidsideaal,” Oase: Journal for Architecture / Tijdschrift voor architectuur 97 (Amsterdam) (2016): 53-60. “Villa Müller, Adolf Loos” in David Leatherbarrow and Alexander Eisenschmidt, eds., Wiley-Blackwell Companion to the History of Architecture, Vol IV, Twentieth-Century Architecture (New York: John Wiley & Sons, 2016): 261-73. “Viennese Design Abroad: Josef Frank and Paul T. Frankl,” in Kevin Tucker, ed., The Wittgenstein Vitrine: Modern Opulence in Vienna, exhib. cat. (Dallas: Dallas Museum of Art, 2016): 117-27 (supplement). Review of Ich warne Sie vor Josef Hoffmann: Adolf Loos und die Wiener Werkstätte, edited and written by Markus Kristan, in West 86th: A Journal of Decorative Arts, Design History and Material Culture 22, no. 2 (Fall-Winter 2015): 229-31.
Review of Koloman Moser: Designing Modern Vienna 1897-1907, edited by Christian Witt-Dörring, in West 86th: A Journal of Decorative Arts, Design History and Material Culture 21, no. 12 (Fall-Winter 2014): 273-75. “Kem Weber: An Important and Rare Vase, Important 20th Century Design, Auction in New York, 11 June 2014, Sotheby’s New York (New York: Sotheby’s, 2014): 84-85.
Review of Lada Hubatová-Vacková, Silent Revolutions in Ornament: Studies in Applied Arts and Crafts from 1880-1930 and Joseph Mascheck, Adolf Loos: The Art of Architecture, in Journal of the Society of Architectural Historians 73, no. 2 (June 2014): 285-87. “Paul T. Frankl: Modern Design in New York and Los Angeles,” Important 20th Century Design, Auction in New York, 18 December 2013, Sotheby’s New York (New York: Sotheby’s, 2013): 48-53. “Braucht Österreich ein Architekturmuseum?” Architektur und Bauforum (Vienna), August 26, 2013: 11.
Review of Claire Beck Loos, Adolf Loos: A Private Portrait, Carrie Paterson, ed., in West 86th: A Journal of Decorative Arts, Design History and Material Culture 20, no. 1 (Spring-Summer 2013): 134-35.
Review of Brněské stopy Adolfa Loose, Jindřich Chatrný and Dagmar Černoušková, eds., and Loos—Plzeň—Souvislosti, Petr Domanický and Petr Jindra, eds., in Umění: Journal of the Institute of Art History, Czech Academy of Sciences 60, no. 5 (May 2012): 432-35.
Review of Cold War on the Homefront: The Soft Power of Midcentury Design, by Greg Castillo, Journal of Design History 25, no. 3 (August 2012): 337-39.
Review of Clemens Holzmeister: Architekt zwischen Kunst und Politik, by Wilfried Posch, in Umění: Journal of the Institute of Art History, Czech Academy of Sciences 60, no. 2 (2012): 168-70.
Review of Pevsner—The Early Life: Germany and Art, by Stephen Games, in Centropa 12, no. 2 (January 2012): 92-93.
Review of Collecting Modern: Design at the Philadelphia Museum of Art since 1876, by Kathryn Bloom Hiesinger, Burlington Magazine 153 (November 2011): 755.
Review of Jacqueline Groag—Textile and Pattern Design: Wiener Werkstätte to American Modern, by Geoffrey Rayner, Richard Chamberlain, and Annamarie Stapleton, in Centropa 11, no. 3 (September 2011): 263-64.
Review of Makers: A History of Modern Studio Craft, by Janet Koplos and Bruce Metcalf, in Burlington Magazine 153, no. 1302 (September 2011): 608-09.
Review of Modernism After Wagner, by Juliet Koss, in Harvard Design Magazine 34 (Summer-Fall 2011): 231-33.
Review of Walter Crane: The Arts and Crafts, Painting, and Politics, by Morna O’Neill, Burlington Magazine 153, no. 1300 (July 2011): 485.
Review of Artistic Circles: Design and Decoration in the Aesthetic Movement, by Charlotte Gere, Burlington Magazine 153, no. 1296 (April 2011): 260.
Review of Adolf Loos—dílo v českých zemích/Adolf Loos—Works in the Czech Lands, Maria Szadkowska, ed., and Junge Meister: Architekten aus der Schule Otto Wagners in Mähren und Schlesien, by Jindřich Vybíral, in Journal of the Society of Architectural Historians 70, no. 1 (March 2011): 124-26.
Review of Josef Hoffmann Selbstbiographie, Peter Noever and Marek Pokorný, eds., in Design Issues 27, no. 1 (Winter 2010): 98-100.
Review of Auguste Perret, die Architekturdebatte und die konservative Revolution in Frankreich 1900-1930, by Christian Freigang, and Adolf Loos: Works and Projects, by Ralf Böck, in Journal of the Society of Architectural Historians 69, no. 4 (December 2010): 586-88. “A Rediscovered Interior by Paul Frankl,” Important 20th Century Design, Auction in New York 16 June 2010, Sotheby’s New York (New York: Sotheby’s, 2010): 62-69. “Adolf Loos and the Biedermeier Revival in Vienna,” in Centropa 10, no. 2 (May 2010): 128-40. “Biedermeier/Neo-Biedermeier: Introduction,” in Centropa 10, no. 2 (May 2010): 78.
Review of the exbhibition “Birth of the Cool: California Art, Design, and Culture at Midcentury,” in Design and Culture 2, no. 2 (Spring 2010): 237-40.
Review of Apostles of Beauty: Arts and Crafts from Britain to Chicago, Judith Barter, ed., in Burlington Magazine 152, no. 1285 (April 2010): 255-56.
Review of Gilbert Rohde: Modern Design for Modern Living, by Phyllis Ross, in Luke Beckerdite, ed., American Furniture 2009 (Milwaukee: Chipstone Foundation/Hanover and London: University Press of New England, 2009): 159-62.
Review of Wittgenstein’s House: Language, Space, and Architecture, by Nana Last, in Estetika: The Central European Journal of Aesthetics 44 (New series: 2), no. 2 (2009): 230-33. “The Origins and Context of Adolf Loos’s “Ornament and Crime,” in Journal of the Society of Architectural Historians 68, no. 2 (June 2009): 200-23. “Architecture: The Built Object,” in Sarah Barber and Corinna Peniston-Bird, eds., History Beyond the Text: A Student’s Guide to Approaching Alternative Sources (London: Routledge, 2009): 154-74. “Kem Weber and the Rise of Modern Design in Southern California,” in The Magazine Antiques 175, no. 5 (May 2009): 96-103.
Review of Lessons from Bernard Rudofsky: Life as a Voyage, Monika Platzer, ed., and Form Follows Libido: Architecture and Richard Neutra in Psychoanalytic Culture, by Sylvia Lavin, in Harvard Design Magazine 29 (Fall-Winter 2008-2009): 161-64, 167.
Review of Oskar Strnad—1879-1935, Iris Meder and Evi Fuks, eds., and Moderat Modern: Erich Boltenstern und die Baukultur nach 1945, Judith Eiblmayr and Iris Meder, eds., in Journal of the Society of Architectural Historians 67, no. 4 (December2008): 610-13. “Paul T. Frankl’s Skyscraper Furniture,” in The Magazine Antiques 173, no. 1 (January 2008): 162-71.
Review of James Marston Fitch: Selected Writings on Architecture, Preservation, and the Built Environment, Martica Sawin, ed., and Architekturgeschichte und kulturelles Erbe—Aspekte des Baudenkmalpflege in Ostmitteleuropa, Beate Störtkuhl, ed., in FutureAnterior: Journal of Historic Preservation, History, Theory and Criticism, GSAPP, Columbia University 4, no. 3 (Winter 2007): 86-94.
Review of SvM: Die Festschrift für Stanislaus von Moos, Karin Gimmi, Christof Kübler, Bruno Maurer, Robin Rehm, Klaus Spechtenhauser, Martino Stierli, and Stefanie Wenzler, eds., in Journal of the Society of Architectural Historians 66, no. 4 (December 2007): 543-45.
Review of Art, Design and Architecture in Central Europe, 1890-1920, by Elizabeth Clegg, in Studies in the Decorative Arts 15, no. 1 (Fall-Winter 2007-2008): 194-97.
Review of Josef Hoffmann Interiors, 1902-1913, Christian Witt-Dörring, ed., in Centropa 7, no. 3 (September 2007): 286-88.
Review of Ernst Plischke: The Complete Work, by August Sarnitz and Eva Ottillinger, in Journal of the Society of Architectural Historians 66, no. 2 (June 2007): 263-65. “The Viennese Secessionsstil and Modern American Design,” in Studies in the Decorative Arts 14 (Spring-Summer 2007): 6-44. “The Wiener Werkstätte at 100,” review essay, in Studies in the Decorative Arts 14 (Spring-Summer 2007): 166-70.
Review of In Wien erbaut: Lexikon Wiener Architekten des 20. Jahrhunderts, by Helmut Weihsmann, in Centropa 7, no. 2 (May 2007): 204.
Review of Architecture and Truth in Fin-de-siecle Vienna, by Leslie Topp, in Studies in the Decorative Arts 14 (Fall-Winter 2006-2007): 113-15. “Wiener Wohnkultur: Interior Design in Vienna, 1910-1930,” in Mark Taylor and Julieanna Preston, eds., Intimus: Interior Design Theory Reader (Chichester, England: Wiley-Academy, 2006): 187-93.
Review of Modern American Silver—20th Century Design, by Jewel Stern, in Burlington Magazine 148, no. 1239 (June 2006): 427-28.
Review of Gottfried Semper and the Problem of Historicism, by Mari Hvattum, in Harvard Design Magazine 24 (Spring-Summer 2006): 106-08.
Review of Karel Honzík: Beyond the Horizon of Objectivity, edited by Dita Dvořáková-Robová, in Centropa 6, no. 1 (January 2006): 82-83.
Review of Czech Architecture and Its Austerity, by Rostislav Švácha, in Umění: Journal of the Institute of Art History, Czech Academy of Sciences 53 (2005): 606-07. “Victor Gruen,” in Encyclopedia of the City, edited by Roger W. Caves. Abingdon, Oxon: Routledge, 2005): 219-20.
Review of Warped Space: Art, Architecture, and Anxiety in Modern Culture, by Anthony Vidler, in Harvard Design Magazine 23 (Fall-Winter 2005): 114-16. “Frankl, Paul T. (1886-1958),” in Soar Allgemeines Künstler-Lexikon, edited by Dankmar Trier (Munich and Leipzig: K. G. Saur Verlag, 2005), vol. 44: 99. “Battle Hall,” in Placenotes, No. 1: Austin, edited by Kevin Keim (Austin: Charles Moore Center for the Study of Place/University of Texas Press, 2005), no. 29. “Emerging Methodologies in Central European Art and Architecture: Introduction,” in Centropa 5 (January 2005): 2. “Paul T. Frankl.” In Modernist 20th Century, 6 June 2004, Wright. Chicago: Wright Auctions, 2004: 2.
Review of Nikolaus Pevsner—Pevsner on Art and Architecture: The Radio Talks, edited by Stephen Games, in Harvard Design Magazine 21 (Fall 2004-Winter 2005). “’The Works of Our People’: Dušan Jurkovič and the Slovak Folk Revival,” in Studies in the Decorative Arts 12 (Fall 2004-Winter 2005): 2-29.
Review of Gustav Stickley, by David Cathers, and Greene & Greene by Edward Bosley, in The Burlington Magazine CXLVI, no. 1215 (June 2004): 411-12.
Review of Die Architektur und ich. Eine Bilanz der österreichischen Architektur seit 1945 vermittelt durch ihre Propagandisten, edited by Maria Welzig and Gerhard Steixner, in Austrian Studies Newsletter 16, no. 1 (Spring 2004): 13, 21. “Austria,” in R. Stephen Sennott, ed., Encyclopedia of Twentieth-Century Architecture, 3 vols. (New York: Fitzroy Dearborn, 2004): I, 91-94. “Josef Frank,” in R. Stephen Sennott, ed., Encyclopedia of Twentieth-Century Architecture, 3 vols. (New York: Fitzroy Dearborn, 2004): I, 471-72. “Richard Neutra,” in R. Stephen Sennott, ed., Encyclopedia of Twentieth-Century Architecture, 3 vols. (New York: Fitzroy Dearborn, 2004): II, 917-19. “Joseph Maria Olbrich,” in R. Stephen Sennott, ed., Encyclopedia of Twentieth-Century Architecture, 3 vols. (New York: Fitzroy Dearborn, 2004): II, 950-51. "Steiner House,” in R. Stephen Sennott, ed., Encyclopedia of Twentieth-Century Architecture, 3 vols. (New York: Fitzroy Dearborn, 2004): III, 1247-48. “Otto Wagner,” in R. Stephen Sennott, ed., Encyclopedia of Twentieth-Century Architecture, 3 vols. (New York: Fitzroy Dearborn, 2004): III, 1427-29.
Review of New Worlds: German and Austrian Art, 1890-1940, exh. cat., edited by Renée Price, with Pamela Kort and Leslie Topp; and Central European Avant-Gardes: Exchange and Transformation, 1910-1930, exh. cat., edited by Timothy O. Benson, with Monika Król, in Studies in the Decorative Arts 11 (Fall 2003-Winter 2004): 124-27. “The Business of Beauty: Paul T. Frankl,” in Over the Top: Helene Rubenstein—Extraordinary Style, Beauty, Art, Fashion, Design, edited by Suzanne Slesin (New York: Pointed Leaf Press, 2003): 38-39, 47.
Review of Jan Kotěra 1871-1923: The Founder of Modern Czech Architecture, edited by Vladimir Šlapeta, in Centropa 3 (September 2003): 277-79.
Review of Dagobert Peche and the Wiener Werkstätte, edited by Peter Noever, in The Burlington Magazine CXLV, no. 1203 (June 2003): 458-59. “Adolf Loos’s Das Andere,” Platform (Spring 2003): 4.
Review of Between Worlds: A Sourcebook of Central European Avant-gardes, 1910-1930, edited by Timothy O. Benson and Éva Forgács, in Centropa 3 (May 2003): 163-64. “The Werkstätte Hagenauer: Design and Marketing in Vienna Between the World Wars,” in Studies in the Decorative Arts 10 (Spring-Summer 2003): 2-20.
Review of The Historiography of Modern Architecture, by Panayotis Tournikiotis in Harvard Design Magazine 17 (Fall 2002-Spring 2003): 86-88. “East Central Europe: National Identity and International Perspective,” Journal of the Society of Architectural Historians 61 (December 2002): 519-29. “Paul T. Frankl in New York, 1914-1917,” in Studies in the Decorative Arts 9 (Spring-Summer 2002): 2-32. “Adolf Loos’s Trotzdem,” in Harvard Design Magazine 16 (Winter-Spring 2002): 64-66.
Review of Joseph Urban: Die Wiener Jahre des Jugendstilarchitekten und Illustrators, 1872-1911, by Markus Kristan; Architect of Dreams: The Theatrical Vision of Joseph Urban, edited by Arnold Aronson; Bertold Löffler: Vagant zwischen Secessionismus und Neobiedermeier, edited by Erika Patka, in Studies in the Decorative Arts 9 (Fall-Winter 2001-2002): 147-50. “Gedanken beim Entwurf eines Grundrisses: Space and Promenade in Oskar Strnad’s Hock and Wassermann Houses, 1912-14,” in Umění: Journal of the Institute of Art History, Czech Academy of Sciences 49, no. 6 (2001): 520-30. “An Alternative Path to Modernism: Carl König and Architectural Education at the Vienna Technische Hochschule, 1890-1913,” Journal of Architectural Education 55 (September 2001): 21-30.
Review of The Pyramid, the Prism, and the Arc: Czech Cubist Architecture, 1911-1923, by Rostislav Švácha, in Umění: Journal of the Institute of Art History, Czech Academy of Sciences 49 (2001): 472-74.
Review of Fashioning Vienna: Adolf Loos’s Cultural Criticism, by Janet Stewart, in Harvard Design Magazine 14 (Summer 2001): 81-83.
Review of Villa Müller, edited by Karel Ksandr, in Umění: Journal of the Institute of Art History, Czech Academy of Sciences 49 (2001): 182-84.
Review of Otto Wagner: Baukunst des Eros, 1889-1899, by Otto Antonia Graf; and Otto Wagner, denkend zeichnen, zeichnend denken: zur diagraphischen Methodologik, by Otto Antonia Graf, in Studies in the Decorative Arts 8 (Spring-Summer 2001): 143-46. “The House as Path and Place: Spatial Planning in Josef Frank's Villa Beer, 1928-1930,” Journal of the Society of Architectural Historians 59 (December 2000): 478-501.
Review of The Architecture of Red Vienna, 1919-1934, by Eve Blau; Romanian Modernism: The Architecture of Bucharest, 1920-1940, by Luminita Machedon and Ernie Scoffham; and The Architecture of New Prague, 1895-1945, by Rostislav Švácha, in Design Book Review 43 (Fall 2000): 50-54. “’A Symptom of the Werkbund’: The Spring 1912 Exhibition at the Austrian Museum of Art and Industry, Vienna,” Studies in the Decorative Arts 7 (Spring-Summer 2000): 91-121.
Review of Paul Engelmann 1891-1965: Architektur, Judentum, Wiener Moderne, edited by Ursula A. Schneider; and Paul Englemann und das mitteleuropäische Erbe: Der Weg von Olmütz nach Israel, edited by Judith Bakacsy, in Umění: Journal of the Institute of Art History, Czech Academy of Sciences 48 (Spring 2000): 109-11. “Architecture in Eastern Europe, 1815–1989,” in Encyclopedia of Eastern Europe: From the Congress of Vienna to the Fall of Communism, edited by Richard Frucht (New York: Garland Publishing, 2000): 35-37.
Review of Béla Lajta: ornamento e modernitá, edited by Marco Biraghi; The Architecture of Historic Hungary, edited by Dora Wiebenson and József Sisa; and CompetingVisions: Aesthetic Invention and Social Imagination in Central European Architecture, 1867-1918, by Ákos Moravánszky, in Journal of the Society of Architectural Historians 59 (March 2000): 118-21. “Accidentism,” by Josef Frank, introduction and translation, in Platform (Spring 2000): 4-6.
Review of Das Bauhaus im Osten: slowakische und tschechische Avantgrade, 1928-1939, edited by Susanne Anna, Studies in the Decorative Arts 7 (Spring-Summer 2000): 142-44.
Review of The Architecture of Red Vienna, 1919-1934, by Eve Blau, in Austrian Studies Newsletter 11 (Fall 1999): 12-13.
Review of Josef Frank 1885-1967: Das architektonische Werk, by Maria Welzig, in Journal of the Society of Architectural Historians 58 (June 1999): 214-16.
Review of The Furniture of R. M. Schindler, Marla C. Berns, ed. ; Otto Prutscher, 1880-1949: Architektur, Interieur, Design, Matthias Boeckl, Gabriele Koller, and Erika Patka, eds. ; Josef Zotti, architetto e designer: 1882-1953, by Roberto Festi; and Die Überwindung der Utilität: Dagobert Peche und die Wiener Werkstätte, Peter Noever, ed., in Studies in the Decorative Arts 6 (Spring-Summer 1999): 115-19. “Imagery and Meaning in the Modern Architecture of Tel Aviv, 1930-1939,” in Platform (Spring 1999): 4-5. “The Other Modern Dwelling: Josef Frank and Haus & Garten,” Working Papers in Austrian Studies, Center for Austrian Studies, University of Minnesota, no. 98-2, January 1999.
Review of Josip Plečnik: An Architect of Prague Castle, edited by Zdeněk Lukeš, Damjan Prelovšek, and Tomáš Valena; Jože Plečnik 1872-1957: Architectura Perennis, by Damjan Prelovšek; and Jože Plečnik: Städtebau im Schatten der Moderne, by Jörg Stabenow, in Journal of the Society of Architectural Historians 57 (June 1998): 227-30. “Modern Architecture in the Habsburg Empire and Its Successor States,” Bulletin of the Society of Historians of East European and Russian Art and Architecture 3 (Winter 1998): 9-11.
Review of Competing Visions: Aesthetic Invention and Social Imagination in Central European Architecture, 1867-1918, by Ákos Moravánszky, in Austrian Studies Newsletter 10 (Spring 1998): 12, 21. “'Palaces of the Future': The Siedler Movement in Vienna, 1919-1923, ” in Building as a Political Act, edited by Randall Ott (Washington, D. C., ACSA: 1998): 84-88. “Wiener Wohnkultur: Interior Design in Vienna, 1910-1938,” Studies in the Decorative Arts 5 (Fall-Winter 1997-1998): 29-51. “Frankova kritika funkcionalism [Josef Frank's Critique of Functionalism],” Zlatý řez (Prague) 14 (Spring 1997): 4-7. “A Voice for a Humane and Comfortable Modernism,” Platform (Winter 1997): 4-5.
Review of Achtung Architektur! Image and Phantasm in Contemporary Austrian Architecture, by Eeva-Liisa Pelkonen, in Austrian Studies Newsletter 9 (Winter 1997): 12. “Ornament, Crime, Myth, and Meaning,” in Architecture: Material and Imagined, edited by John K. Edwards (Washington, D. C.: ACSA Press, 1997): 440-45. “Modern Swedish Glass Design,” Scandinavian Review 84 (Winter 1996): 48-52.
Review of The Architecture of New Prague, 1895-1945, by Rostislav Švácha, in Slavic Review 55 (Fall 1996): 668-69. “Josef Frank: The Making of Modern Swedish Design,” Scandinavian Review 84 (Autumn 1996): 56-62. “Jože Plečnik in Vienna and Prague, 1901-1921: The Search for Architectural and Cultural Identity,” in Slovene Studies, Special issue on Jože Plečnik 18/2 (1996): 171-80.
Review of Krakau unter österreichischer Herrschaft 1846-1918. Faktoren seiner Entwicklung, by Jacek Purchla, in Jahrbücher für Geschichte Osteuropas 44, no. 2 (1996): 296.
Review of Kunst in Österreich 1945-1995, edited by Patrick Werkner, in Austrian Studies Newsletter 8 (Fall 1996): 12-13. “Oswald Haerdtl” in Jane Shoaf Turner, ed., The Dictionary of Art, 34 vols. (London: Macmillan, Press, 1996): 14: 25. “Friedrich Ohmann,” in Jane Shoaf Turner, ed., The Dictionary of Art, 34 vols. (London: Macmillan Press, 1996): 23, 372. “Otto Prutscher,” in Jane Shoaf Turner, ed., The Dictionary of Art, 34 vols. (London: Macmillan Press, 1996): 25, 673-74. “Oskar Strnad,” in Jane Shoaf Turner, ed., The Dictionary of Art, 34 vols. (London: Macmillan Press, 1996): 29, 777. “Ernst A. Plischke,” in Jane Shoaf Turner, ed., The Dictionary of Art, 34 vols. (London: Macmillan Press, 1996): 25, 48.
Review of Ludwig Wittgenstein, Architect, by Paul Wijdeveld, in Austrian HistoryYearbook 27 (1996): 346-47.
Review of The Texas Rangers, Notes from an Architectural Underground, by Alexander Caragonne, in Southwestern Historical Quarterly 99 (January 1996): 430-31.
Review of Plečnik: The Complete Works, by Peter Krečić, and Jože Plečnik, Architect: 1872–1957, edited by Francois Burkhardt, Claude Eveno, and Boris Podrecca, in Journal of the Society of Architectural Historians 54 (March 1995): 98-100.
Review essay: “A Sea Change in the History of Viennese Modernism,” Umění: Journal of the Institute of Art History, Czech Academy of Sciences 43: 6 (1995): 601-3.
Review essay: “Modernist Architecture in Prague,” in Austrian Studies Newsletter 7 (Fall 1995): 14.
Review of Villa Müller: A Work of Adolf Loos, by Leslie van Duzer and Kent Kleinman, in Umění: Journal of the Institute of Art History, Czech Academy of Sciences 43: 1-2 (1995): 182-84.
Review of Josef Plečnik, 1872–1957, Architectura perennis, by Damjan Prelovšek, Austrian History Yearbook 26 (1995): 291-92.
Review of Otto Wagner: Reflections on the Raiment of Modernity, edited by Harry Francis Mallgrave, in Journal of the Society of Architectural Historians 53 (September 1994): 363-64. “Josef Hoffmann,” in Randall J. Van Vynckt, ed., International Dictionary of Architects and Architecture, 2 vols. (Detroit and London: St. James Press, 1993): I, 395-97. “Adolf Loos,” in Randall J.Van Vynckt, ed., International Dictionary of Architects and Architecture, 2 vols. (Detroit and London: St. James Press, 1993): I, 527-59. “Joseph Maria Olbrich,” in Randall J.Van Vynckt, ed., International Dictionary of Architects and Architecture, 2 vols. (Detroit and London: St. James Press, 1993): I, 623-25. “Secession Building,” in Randall J. Van Vynckt, ed., International Dictionary of Architects and Architecture, 2 vols. (Detroit and London: St. James Press, 1993): II, 122-23. “Im Garten Eden: Frank Lloyd Wrights Erbe,” Architektur & Bauforum 24 (1991): 49–51. “Is Modernism Really Dead?,” in Birgit Wagner and Ernst Strouhal, eds., Falter, special issue: Ach ja, die Postmoderne. Vienna: Hochschule für angewandte Kunst, Summer 1987: 6.